Organizations handling transactions involving credit or debit cards are facing increasing pressure to meet regulatory compliance mandates. In particular, they must comply with the Payment Card Industry Data Security Standard (PCI DSS) version 3, which went into effect in January of 2015. 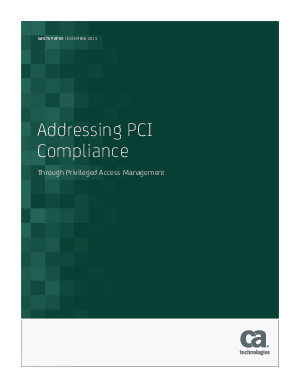 Many organizations not only struggle to meet the PCI DSS v3 identification, authentication and access control requirements. Download to learn how a defense in depth approach to privileged access management delivered in an easy to deploy solution, such as CA Privileged Access Manager, can help organizations to address PCI DSS v3 requirements and better protect not only their CDEs but also their entire hybrid IT enterprise spanning across their network, server, virtual and cloud environments.